The first family vacation after Anouk was born. Destination Sri Lanka 22-29 May, 2016. 15-month old Anouk and her parents boarded the 50 min Srilankan airlines flight from Trivandrum to Colombo at 0900. Finished immigration and came out of the Bandaranayake airport at 1030. The non-crowded public transport bus from just out of the airport to Colombo Fort took around 45 minutes. 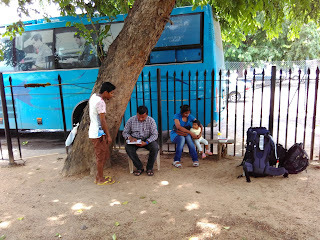 Instead of catching the Unawatuna bound train from Colombo Fort rly station, we caught a tuk-tuk to Maradana ( 1 rly station away and starting point for the Una' bound 2pm train), to beat the rush at Colombo Fort. 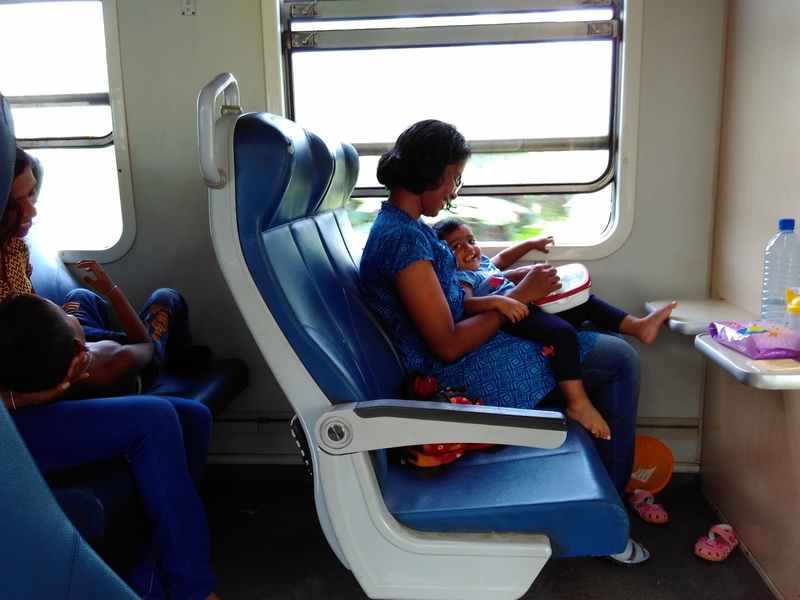 2nd class train journey to Unawatuna was a relaxing one on a Sunday afternoon except for the last-minute rush at Una' station after realizing that the station platform is a short affair and had to dash full pace with kid and backpacks, inside the train to get to the platform. Thanks to kind fellow passengers who signaled the station master that a gang of 3 is still running inside the train to find the platform to alight; he stalled his green flag wave till he saw the three of us safely in the platform. The hotel was just a km from the rly station and a short tuk-tuk ride took us there. And finally checked in at Gloria Grand Unawatuna, which was to be our home for the next 6 days. Unpacked, refreshed and had a wind down evening, to get charged for the week before us. After the sumptuous "Srilankan" (have to order previous night, else you'll be served Western cuisine) breakfast, with stringhoopers (similar to Idiyappam), appam, and a wide variety of side dishes, veg and non-veg, we were ready to start exploring the place, by ~9am. Took a tuk-tuk(< 4km) to Yatagala Raja Maha Viharaya, an old, built-in-boulder-Budhist-temple. Not crowded at all, peaceful and kid loved all the climbing up and down the stairs. Had a very calm feel to the place. Back to hotel by lunch time, bought lunch takeaway from "Mati Gedara", a small eat out, a few buildings away from the our hotel. Was surprise to see food, very similar to Kerala cuisine, (like chakka-puzhukku. thoran, chammanthi, fish curry) and equally tasty. After lunch and a long naptime for Anouk, it was time to hit the beach. 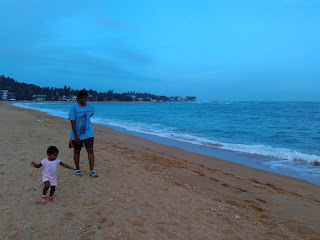 Unawatuna beach was a mere 5 min walk from the hotel, at the end of Welle Dewalaya road. Anouk had such a grand time in the beach, and like with most toddlers, had a hard time ushering her back an hour later, when it started drizzling. the paved streets, old Dutch churches, the light house, archaelogical museums, and finally the ramparts. Originally built in the 16th century, and later fortified by the Dutch, Galle Fort is a UNESCO cultural heritage site. The walk on the ramparts along the ocean looked very inviting barring the blazing sun and we had to stop trail after half an hour. Anouk was fed a quick brunch and we came back to our room(another bus ride, with a napping child) with a lunch takeaway, from the restaurant in the main road, near the bus stop. (We resorted to this restaurant for the rest oflunch/dinner during the stay, it was 4x less expensive than Mati Gedara at same quality of food). Anouk was pretty tired after the all-out-morning in the sun and dozed soon after lunch. 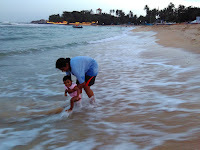 We decided to spend a nice evening in the Unawatuna beach and recovering for the next day. Btw, we decided to come back to Galle on another day, possibly in evening. The weather forecast proved accurate, and it was raining till around 11:30 am. No complaints, as Anouk had decided to take a deep nap after another heavy and delicious 8am breakfast, which also let the parents catch up with planning for the day and next as well as arrange the laundry without having to worry about folded clothes found lying in a heap under the bed, with a mere 5 min of unsupervised time. After lunch, we boarded the train (Rly station was a km away) to Ahangama, for a visit to Handunugoda white tea plantation. The tuk-tuk ride from Ahangama railway station to the tea plantation took around 25 minutes. It was a first time for us, to visit a tea estate, and their guide gave a full round tour around the plantation, explained the plucking process, especially for the white tea variety(claimed to be untouched by hand),showed us different varieties of tea, took us to the tea processing factory, explained different machines, served us tea with cake and finally the grand bonanza -the tea tasting session, where around 100 different tea has been brewed and kept for tasting. Tried a few of them and bought a variety which we both liked, to take home as a souvenir to parents. Spent the entire afternoon in the outing and was back in the hotel after a relaxing train journey. 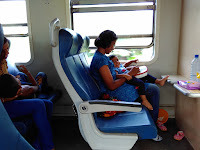 The train journey between Ahangama and Unawatuna took around 45 min, one way. till the day we left for Colombo; he was interested in Tamil Nadu politics and aired his criticisms for Jayalalitha's reforms. Browsed the art galleries near Galle Fort for a while, waiting for the sun to be kid-friendly. Had a long amazing walk above the ramparts starting from the light house. Anouk loved the walk (refused to be carried in the baby seat for long) and the view of the ocean. The evening sun was a beautiful sight behind the lovely sea. The Galle International Cricket Stadium is right opposite to the old town of Galle. Caught another tuk-tuk back to the hotel by around 7pm and settled in for dinner and a cool evening. 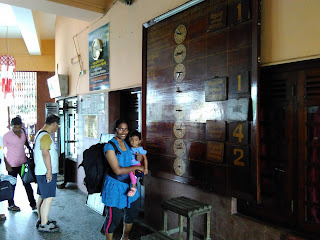 The day, yet again, started with the drizzling rain, and we made good use of the time to start preps for the next morning's train travel to Colombo, in preparation for the return flight from Colombo. Spent the morning with the arrangements (Anouk seemed to make it a habit to hit bed after a full tummy of yummy breakfast) and were done with lunch just in time the drizzle stopped. Set out immediately after lunch to catch the afternoon train to Mirissa. A very relaxed train journey, beautiful and scenic rly station backdrop and the village ways, and ever-needed-hike to even spot a tuk-tuk filled up the onward journey to Mirissa. 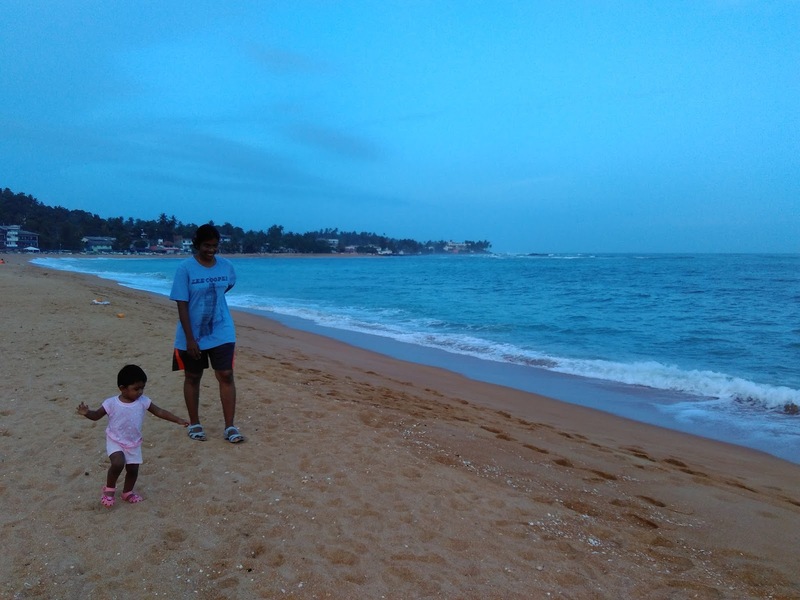 The beach is stunningly beautiful (the second time I felt so about a beach, after Bondi) to the core and very clean, with much whiter sand unlike the Unawatuna beach. The waves were simply awesome and the beach was almost empty. Anouk had a gala time in the beach. 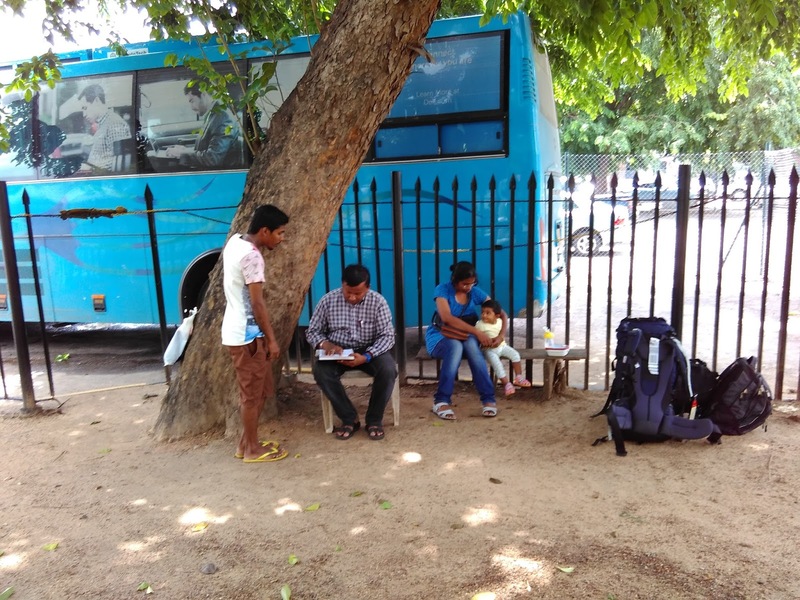 The return journey to the railway station was with another tuk-tuk, having checked the train timings before. Back to hotel in the evening and the rest of the late evening went in packing up for the next day's morning train back to Colombo. We had just finished checking out, said good byes and thank you-s, by the time our tuk-tuk driver arrived punctually at 9am. Took 10 min to reach the Galle railway station. Another round of bye-bye and thankyou and caught the train back to Colombo. At Colombo, further caught a local train and a tuk tuk to reach Airport villa (at Katunayake, ~2km from airport), by around 3 pm to settle in for the night. They agreed to arrange the cab for early next morning trip to airport. Got refreshed, went out to get dinner, browsed the super market over there and settled in for an early night after a long day's train journey. Day 8 (29 May 2016) - Home, sweet home. Caught the fully crowded Sri Lankan airlines flight, which got delayed almost by an hour, and eventually took off at 10am. Reached Tvm airport by 11, brother came to pick us up and were back home 10 minutes later, as a group of tanned kid and happy parents. Gloria Grand hotel is situated in Welle Dewalaya road, leading to Unawatuna beach and the Welle Dewalaya. The hotel room rent was ~SGD 54 per day with complimentary breakfast. The room was cozy with a balcony, and a mere 5 min walk to the beach.The Welle Dewalaya road was crowded with homestays, a few hotels, lot of and infinite possibilities of eateries at different price range(med-high-insanely high) owing to the tourist population. We accidentally realized during one of our walks from the bus stop, just at the entry to the main road that, the eateries in the main road, serve equally good, 10x cheaper food at non-fancy restaurants. In fact, we saw a lot of tourist customers in those shops. From then on, we just resorted to those restaurants for the lunch/dinner take away. The staff at Gloria Grand had accommodated our request for the brown rice-porridge for (then) 15 month old Anouk's dinner, every night, and that was extremely nice of them. We had pondered over a few gift ideas for Anouk's first birthday and after a few rounds of brainstorming, decided to come up with an alphabet and numeral wall, thanks to really big white walls in the hall. Activity went like : stencil printout - pasting on thermocol - coloring (I like outlining with black sketch-pen) - cut out - pasting on the wall - hoping that the lowest row doesn't get pried upon very often by the kid on top of the sofa.